When They Need It The Most!" ...then this may be the most important message you ever read about pets. They Need Your Help The Most? I'm Dr. Andrew Jones, and I have practiced Veterinary Medicine for over a decade. Over the past 15 years I have treated thousands of pets for a variety of problems, and currently own the Nelson Animal Hospital in Nelson BC, Canada. Most pet owners have no idea how to perform CPR, or even begin to give basic medical care to their pet. But you should know these things, because in some emergencies, you can't always get to the Vet in time. We live in a world where EVERY DAY even the most loving and responsible pet owners face the anxiety of caring for pets that are bitten by other animals, swallow dangerous objects, eat something poisonous, and are hit by cars... and the list goes on. Knowing what to do in any emergency situation can mean the difference between life and death. The point of this is not to scare you, but to make you aware. Accidents, seizures and emergency medical problems can and do happen, every day. As a responsible pet owner, you should know what to do in the event that your pet is in need of emergency care. The purpose of Pet First Aid is the same as with us humans... it's to ensure, as much as we can, that our patient (our pet!) is taken care of as best as possible, so that when we arrive at the emergency vet, our pet has the highest possible chance of survival. Thank you for your Veterinary Secrets Revealed! I just wanted to let you know that I have bought your book & am very happy with it! Shortly after buying it, a friend of mine had a German Shepherd that was very sick, but he didn't know what the problem was. We email each other quite often, so I asked him what symptoms the dog was having. Thank you for providing this tool to people like me who don't want to always rely on tradional pharmaceuticals with there inherent side effects. " Thank you. Excellent value for money. " Dr. Jones, I want to get my hands on Pet First Aid Secrets now! 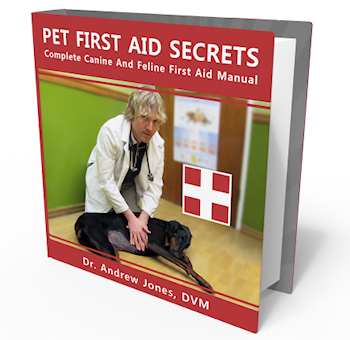 Pet First Aid Secrets: Complete Canine And Feline First Aid Manual is a digital book (e-Book) that can be delivered to you in a matter of seconds in a universally readable PDF format. That's right - the moment you submit your order on our secure server (your payment details are absolutely safe) you'll have instant access to the information that can prepare you for an emergency with your pet. I'm confident that you and your pet will benefit from the information in this book. Once you go through the book and practice the techniques, you will gain peace of mind knowing that should your pet ever need your help in an emergency, you will be prepared. "The Dog And Cat Vaccine Code"
"Pet Food: Keeping Your Pet Healthy"
Raw Food: Is it safe for your pet? Get "Pet Food: Keeping Your Pet Healthy" now! "Herbal Solutions: Introduction To Healing Your Pet With Herbs"
Pet First Aid Secrets For A Full Refund. ...then please contact me within 60 days and I'll quickly provide a full refund - with no objections and no hard feelings. And remember... your bonuses are yours to keep, no matter what, as an expression of my appreciation for your willingness to explore new ways to care for your pet. All I ask is that please, before you return it - for the sake of your pet, at least read a few of the sections and practice a few of the techniques. You have nothing to lose, and it could mean the difference between life and death for your pet. Your best friend will thank you... so claim your e-book now! When you click the button to download your copy, you get instant access to all the information. That means you can begin learning the techniques within the next 2 minutes, no matter where in the world you are or what time it is (even if it's 3 a.m. on a Sunday!). Remember, this is a digital book - an e-book - in PDF format, and so are the bonuses. They tell me that PDF stands for "Portable Document Format" which means it can be opened and read on any computer. I'm a Veterinarian, not a techno-guru but I do know that e-books are are simple to use. Plus the PDF format makes it easy to search and find the information you're looking for. Or, you can print it out and have it ready to refer to on a moments notice. Yes, Dr. Jones! I Can't Wait To Download Pet First Aid Secrets! I want to be ready to care for my pet when injury strikes. 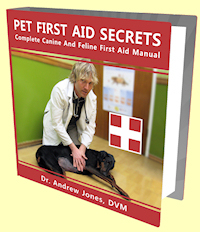 I understand that once my order is processed, I will be able to immediately download "Pet First Aid Secrets: Complete Canine And Feline First Aid Manual", so I can start learning the techniques to help my pet right now. I understand that I have 60 days to test each and every bit of information in your book and bonus digital books and if I and my pet are not 100% thrilled with the amazing information, I'll get a full refund. I understand that I can keep the 3 bonuses (including the CD I'll receive in the mail), even if I request a refund. * Looking for the Printed Version? You know it's the right thing to do for your pet. And you have 60 Days to see if this information works for you (you can get your money back at any time within those 60 Days!). On top of that, you get $82.00 worth of special FREE bonuses that will further enhance your pet's quality of life! Obviously, there's no risk involved - only security and peace of mind. Please prepare you and your family to care for your pet in any situation, for your pet's sake. P.S. - I know that if you have read this far on the page, then you really are devoted to your pets and you want to give them the best possible care. 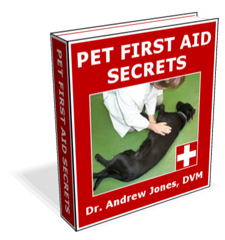 The Pet First Aid Secrets First Aid Manual will show you the techniques you need to know to be prepared for an emergency with your pet. Order now and you'll be prepared for whatever the future brings to you and your pet. P.P.S. - In addition to the book you get $82.00 worth of special FREE bonuses that will further enhance your pet's quality of life. P.P.P.S. - I have a no-questions-asked 60 Day Money Back Guarantee. I am a "real" person who also owns a veterinary clinic, and I back up my product 100%: You will receive a full refund if you are not thrilled with the information. PLUS, no matter what you decide, the bonuses are yours to keep forever (including the Pet Health Tutorial CD!). Click here to order now! "Pet 911: Top 7 Common Pet Health Emergencies" and FREE e-book, "Healing Your Pets At Home"